After being added to ethanol, the raw lumps of resin quickly turn white and make the solution turn cloudy. Applying daily gentle agitation, the resin appeared to be slowly dissolving, forming a milky-straw coloured, creamy-consistencied mix. After about two weeks, progress had stopped. I attempted to filter out the foreign material using a linen cloth. A lot of the resin lumps were still there, albeit of a soft, sticky consistency. Perhaps the saturation limit of the solution is lower for Brazilian copal than for shellac. I added ethanol to the top of the filter apparatus to see if I could get more varnish to flow through the filter. It worked a bit, but I was now left with a much more dilute solution, and it was still very cloudy. In shellac, cloudiness indicates the presence of wax. In raw shellac there's a lot of it- maybe 20%. It's not really soluble in ethanol (I believe the term is that it forms a colloidal dispersion), but you can paint with it anyway because when dry it becomes fairly transparent. 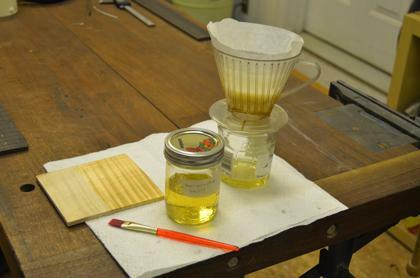 The wax makes the finish film less durable, however, and often less clear, so for fine work it is generally removed by letting it settle to the bottom of the jar and decanting the clear solution on top. Perhaps I should try this? After all, Mizler's instructions did not say to agitate the solution, just to let it sit for a while. D'Oh! Sure enough, after two more weeks the cloudiness in the dilute, semi-filtered solution had settled on the bottom of the jar. I decanted the clear solution into a small jar. Then just for the sake of curiosity I ran the thick whitish goop from the bottom of the jar through a coffee filter, and obtained yet more clear varnish (after all that waiting I didn't want to waste anything). Success! The solution is a lovely clear, canary yellow colour, but very dilute and fluid. I tried applying some to a piece of curly maple with the recommended soft brush. It appears to be very clear and gives good depth to the apprance of the wood, but too thin. Unless I can make a stronger solution this is not going to be suitable as a guitar finish- it'll just take too long to build up.